The Association of English Graduate Students (AEGS) is happy to announce its 6th Annual Graduate Student Conference. 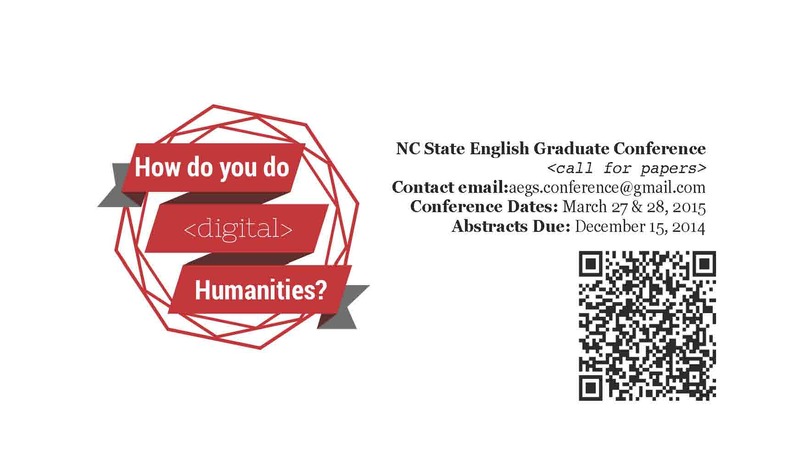 The AEGS Conference will be hosted at NC State University March 27 & 28, 2015, and is open to any graduate students who have an interest in answering our question: How do you do <digital> Humanities? The conference is an amazing experience for graduate students who would like to present their work in a relaxed and supportive environment. And without any registration fees, it is a free chance to join a growing interdisciplinary conversation. Additionally, we will have a panel of digital humanities researchers to provide insight into the DH community; panel details TBA. Any questions can be sent directly to aegs.conference@gmail.com or addressed to the Conference Co-Chairs, Gavin P. Johnson and Jordan Smith. The CFP and additional information about the conference and the surrounding area is provided on our website, http://aegsconference.wordpress.com. Proposals are due by Friday, January 16, at 11:59 pm.